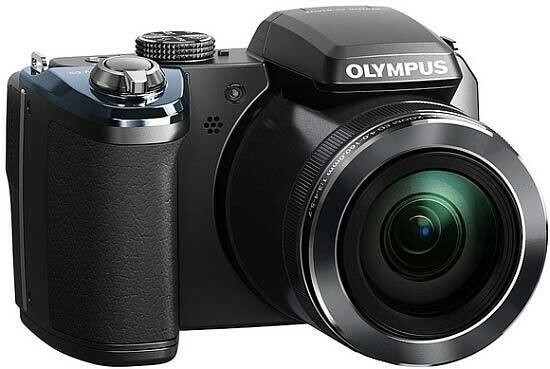 The Olympus SP-820UZ is the successor to last year's SP-810UZ camera. 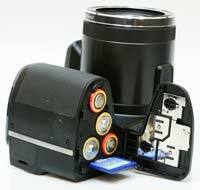 The Olympus SP-820UZ is an AA battery powered ultra-zoom digital compact camera with a 40x optical zoom, 22.4mm wide-angle view and a 14 megapixel CMOS sensor. Other standout features include a 3-inch LCD screen with a resolution of 460K dots, 1080p HD video with simultaneous photo and video capture, 240 frames per second slow-motion video mode, in-camera 360° panorama stitching, Backlight HDR mode and an extensive range of Magic Filter effects. 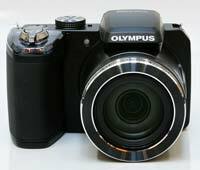 The Olympus SP-820UZ is available in black or silver for £279.99 / €349.00 / $329.99. 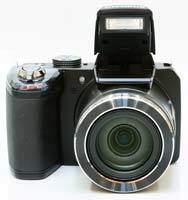 The Olympus SP-820UZ is very similar in design to the previous SP-810UZ model, so a lot of comments that we made about that camera apply equally to the SP-820UZ. The first thing that struck us about the design of the Olympus SP-820UZ was how attractive it is. From the oversized lens barrel to the shiny plastic bits, the camera is good looking enough to attract admiring glances. Apart from the sharp angled grip and integrated flash that droops over the lens barrel, the large lens and smaller body design reminds us of the Sony NEX compact system cameras. The design is reflective of previous models but the SP-820UZ looks a little more sleek and snazzy with its flush screen. The pop-up flash also sits slightly higher thanks to a redesign that incorporates the entire unit. The body is a little small to hold effectively with both hands and we had to curl our fingers underneath to hold the lens and not interfere with our right hand. The increased zoom range takes the SP-820UZ from 36x to 40x, or 22.4-896mm in 35mm terms. That's enough to make even the wariest of wildlife feel uneasy. This eye-watering optical zoom is supported in a number of different ways. Firstly, Olympus have fitted ED glass and the camera houses two image stabilising methods to ensure the chances of a sharp picture. Obviously the more the zoom is used, the lower the angle of view and so less light can get into the lens. More emphasis has been placed on the camera's handiness for travelling photographers. The lens plays an important role in this marketing strategy because it will be more likely to capture something without the inconvenience of actually having to walk there, useful if you're on the go. The dedicated video button on the back ensures you can get instant video recording if required. The camera is SDXC compatible which is great for ultra high storage, although the highest capacity so far is 64Gb. You could also look at Eye-Fi cards as the SP-820UZ is Eye-Fi compatible and it's a memory card that will automatically transmit its contents when it finds a free-of-charge wi-fi area. The Olympus SP-820UZ feels very well built. There's a heaviness to it that feels nice when it's held and there are no bendy or flexible parts. There's practically no play in the lens whatsoever - which is nice - but it does pop out an uncomfortable amount adding length to an already protruding lens. There are only a few buttons on the back of the SP-820UZ. At first we thought it was touch-screen and maybe we'd missed the blurb. It's not. Olympus have just been clever in the working of the menu system. To enter the function menu which is situated down the right side of the screen, simply press the Info button and it will scroll through the options that the yellow arrow is hovered over. To move through the options, use the wheel as a navigation pad pressing up, down, left and right to move through. A new addition to the SP-820UZ is the shooting mode dial on top of the camera. You can choose from program, intelligent auto, traditional scene modes (portrait, landscape, sports and 13 others), Beauty, Panorama, Handheld Starlight, Photo with Movie Clip, and Magic! Magic mode sounds wonderful but in reality it's a similar menu to the digital effects or filters that other manufacturers already use. There are some interesting effects such as Punk, Sparkle, Watercolour and Reflection. The resolution drops to around 5 megapixels and some of them aren't available in video mode but the camera will at least tell you if it isn't an option. The menu has been revamped to a modern black, grey and white style with highlighted lettering in yellow. Surprisingly, normally important modes such as resolution and focusing are in the main menu instead of the function menu for easier access. The white-balance mode is interesting. Instead of a small icon to illustrate which option you've selected with the cast correction showing in the background, Olympus have opted to scroll through thumbnails of the background with the wording of the white-balance over it. If you're used to the icons, they're still used on the function menu task bar on the right side of the screen. 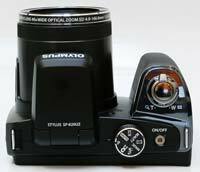 There are four burst modes on the Olympus SP-820UZ. They're categorised as burst mode, Hi1, Hi2 and Hi3. All four modes take sequential images but as you move through the numbers, the resolution gets lower which in turn increases the frame rate that the camera can shoot in. At full resolution, we managed to achieve an average frames per second of 3fps. In reality, the camera shoots three pictures in succession then has to stop to unload the buffer. The annoying thing about this is that if you want to continue shooting, you have to release the shutter button, refocus and carry on taking pictures. Start-up time is decent. We managed to start the camera up, focus and take a picture in just under three seconds. Shutter lag appears to be slower than other digital compact cameras available. Normal results are around 0.15 seconds which - when you put it in perspective - is still good at just over a tenth of a second. But we've had results at 0.08 second from other cameras which is nearly half that speed. We did get that result once in the test but the most frequent results we got were at the slower speed. Focusing is thankfully pretty fast, it finds subjects quickly without too much hunting or misses. In playback, you can zoom in and out to get a better view either closing in to check focusing or zooming out to see a collection of the pictures you've taken that day. Hitting the menu button opens up the same menu system as found in the shooting mode but the camera jumps straight to the playback options. There's the option to perform basic editing on the pictures during playback. It's in the menu and you can crop pictures and use Beauty Fix which removes red-eye, smooths skin, makes eyes sparkle and adds drama to the eyes. You can choose these options individually or employ all of them. It's possible to increase the dynamic range using shadow adjust. It creates more detail in dark areas, makes exposures more even and essentially removes contrast. Olympus have kept the paperwork to a minimum in the box of the SP-820UZ. There's only a warranty card, Basic Manual and CD software which contains Olympus Viewer 2, registration help and full instruction manuals. 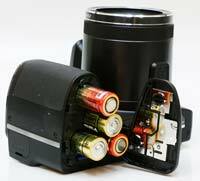 The camera also comes with a lens cap, strap, and four AA batteries.